Painting, for me, is about color, shape, and rhythm. My landscape paintings are about real places, mostly done on location Over the years I have made many paintings about places which pre-occupy me. Some of these places show up in my "Bridge," "Cumberland," and "Freeport" paintings. In recent years I have been disassembling the imagery of these places. My abstract paintings reflect the colors and patterns of the landscape. The Maine landscape figures prominently. My paintings of the human figure are about figures embedded and immoblized in space. When I start a painting I do not know where it will take me. When I finally resolve it, I discover what drove me to do it in the first place. I think the sources of painting, and of art generally, are unknown to us. They flow ultimately from the mystic law. Jan ter Weele in the studio. Jan ter Weele was born in The Netherlands. In 1940 his family escaped from Holland after it was invaded and occupied. He now lives in Falmouth, Maine, with a studio in Portland. Solo exhibits of his paintings have taken place at Aucocisco Gallery, Cooper Jackson Gallery, the Gallery at The Clown, and Urban Dwellings, all in Portland. Other solos were in the Maine Art Gallery vestibule in Wiscasset and the Cerulean Gallery. His paintings have been in many invitational shows including a four-person show at Gallery 415 in Chicago, three separate shows at the New O'Farrell Gallery in Brunswick, Maine (along with Neil Welliver and Lois Dodd, among others), a show at Gold/Smith Gallery in Boothbay Harbor, Maine, a show at the University of Maine at Lewsiton-Auburn, and successive shows in 2010 and 2011 at George Marshall Store Gallery in York, Maine. In 2014 and again in 2018 his paintings were in three-person shows at the George Marshall Store Gallery. In 2014 he was selected for the Monhegan Island Art Residency where he spent a month from early September to mid-October. 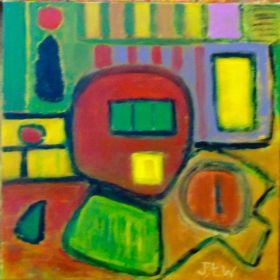 This was a productive period during which time he completed 24 abstract paintings, working in acrylic on 18 x 18 inch canvas supports. He studied at Maine College of Art, Massachusetts College of Art, Honolulu Academy of Art, and on two separate occasions at the Art Students League of New York with John Hultberg, Peter Golfinopoulos, and Cornelia Foss. His paintings are in private collections throughout the United States, Europe, and Japan.